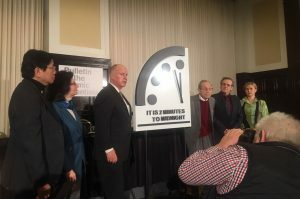 His comments were made at the Bulletin of the Atomic Scientists Doomsday Clock unveiling at the National Press Club. Brown is executive chair of the Bulletin of the Atomic Scientists. Available for a very limited number of interviews, Cohen is professor emeritus at New York University and Princeton University. He is author of the just-released book War with Russia? From Putin and Ukraine to Trump and Russiagate. His recent pieces include “Anti-Trump Frenzy Threatens to End Superpower Diplomacy” and “The End of Russia’s ‘Democratic Illusions’ About America” for The Nation. Brown made his comments in response to a question about Russiagate posed by Sam Husseini, contributing writer to The Nation and senior analyst at the Institute for Public Accuracy.